The Sunken Road is a subterranean pass linking Mournoth and the Fallen Wastes. It is far less famous than the Bangkorai Pass, known mainly by the peasants in the region, who sometimes use to avoid paying the toll at the Pass. Many times throughout history, the soldiers of the Bangkorai Garrison have successfully stopped invaders from pouring through the Bangkorai Pass, protecting the lands beyond it from military conquest. In 1E 874, a horde of Orcs and goblins which had been displaced by the Redguards flowed west, but were denied passage at the Bangkorai Pass. They were forced to head northeast into the Dragontail Mountains in order to reach Orsinium. Then, in 1E 1029, when the Imperial Legion under Empress Hestra deposed King Styriche, the Vampire of Verkarth, he and his Gray Host fled west, burning and killing as they came, but were successfully stopped and routed at the Pass. Their success is attributed to the sacrifice of Saint Pelin, who is still praised in the region. Hestra's legions caught and killed the stragglers from the Gray Host, and High Rock was annexed into the Alessian Empire. When High Rock decided to secede in 1E 2305, the Legions of Piety and Grace under the command of Abbot-General Priscus Mactator were sent to quell them. Though the legions are said to have filled the Fallen Wastes from end to end, they found themselves unable to get past the Bangkorai Garrison, which then under the rule of Baroness Falinne Guimard. 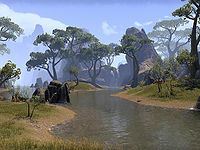 After a five-month siege, they gave up and returned to Cyrodiil. On Sovereignty Day, the people of the region traditionally celebrate this victory by going for a picnic. Only once did the Garrison fail to protect High Rock: when Durcorach's horde of Reachmen poured down the south shore of the Bjoulsae circa 2E 541, they found a way to filter through the Northwest Spine of the Dragontail Mountains. The Garrison was left unprepared, as the mountains had always served as a barrier to invading armies before. After a three-day siege, Evermore was sacked, and the Garrison was taken from behind. Hallin's Stand held out longer, but nevertheless, Durcorach's horde sped through Bangkorai in a matter of days. In the Second Era, besides trouble from the Reachmen, there were fears of an Imperial invasion from the south. The populace looked to powerful rulers around the Iliac Bay to help drive out the troublemakers. Bangkorai is known for its spiced wine. Bangkorai is apparently plagued by jackals.